I am deffinetly one of those girls who squeals at movies when the couple kisses. Who am I kidding, I squeal when I see cute moments in real life too. Just can’t help it, love is so cute! 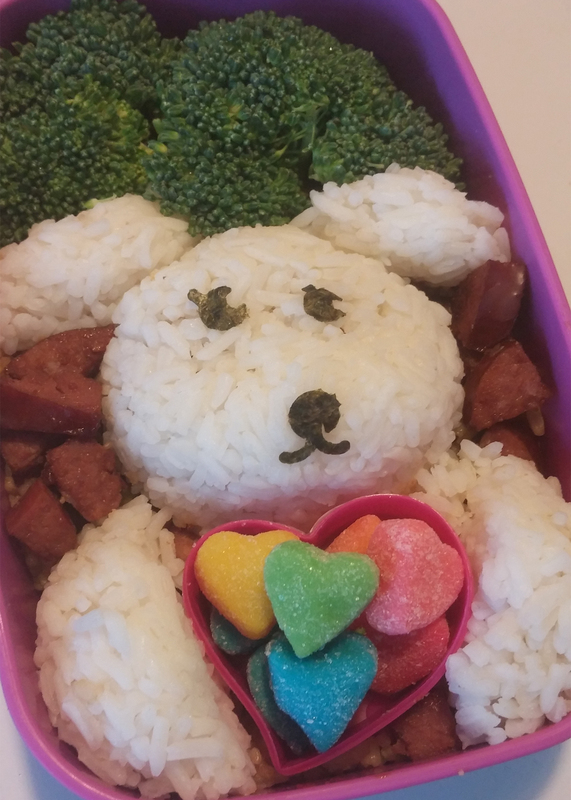 And speaking of cute, have you seen this bento?!?! I am so excited for how this little guy turned out. Honestly this lunch just kind of happened. I was planning on making just a real simple lunch, but then I had a little extra time and I started to play. I know they say you shouldn’t play with your food, but what fun is that! I have to apologize a bit. 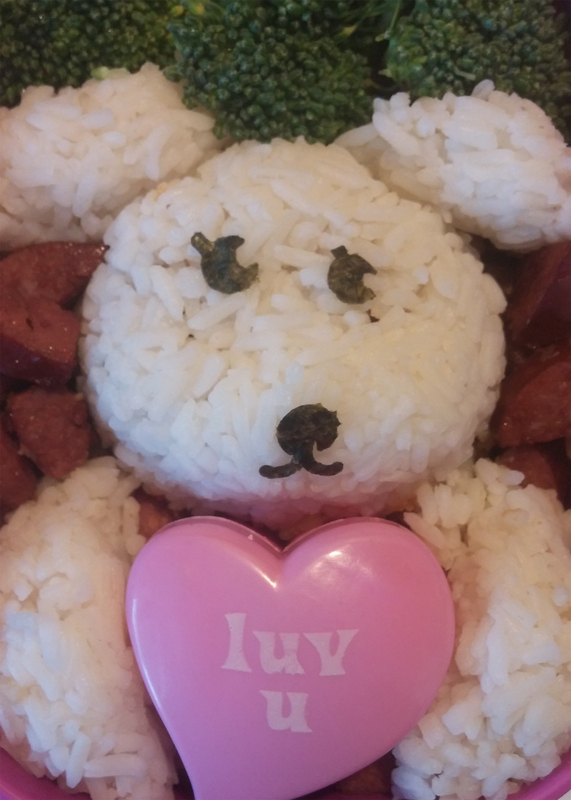 I must admit that while making this bento I didn’t do the greatest taking instructional pictures. A mixture of just going with it and my growing excitement of how it was looking caused me to forget about my camera. 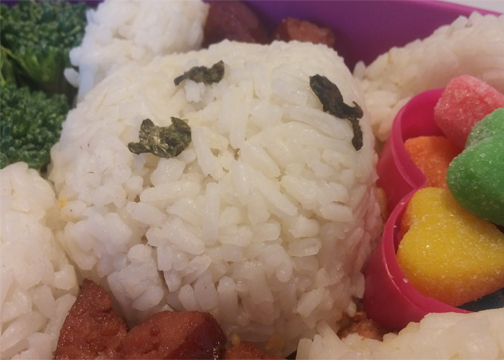 In my defence though, although it looks complicated this bento is actually really easy, and came together very fast. 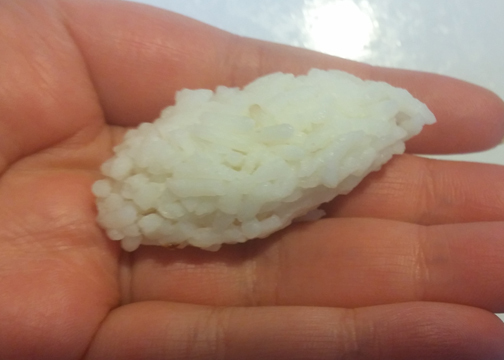 All you have to do is shape some rice and your done! 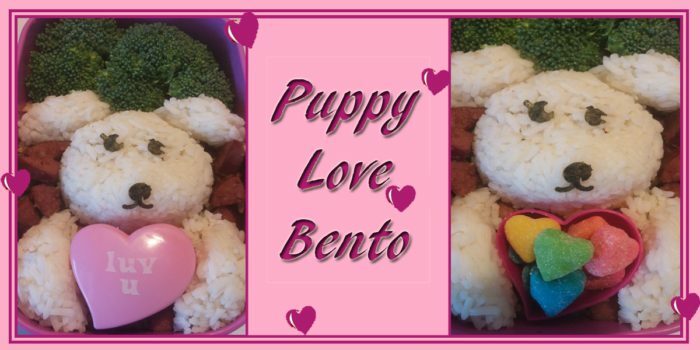 ♥Heart treat box- got a bag of these at the dolor store. First thing I did was lay down a bed of a fried sausage for the puppy to lay on. This way you have plenty there to eat, but you don’t have to see it all. Make a little hole for the treat box to sit. If you don’t have a little container like this can also use those silicone cups or even a cupcake liner. Once that is in place we are just going to build the puppy around it. To start with the head you will want to cover your hand with a piece of saran wrap. 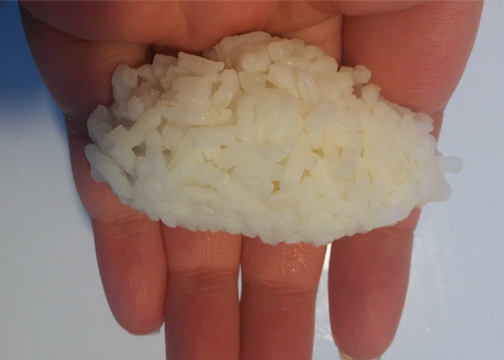 This will make it so you are able to shape the rice without having it stick to you. 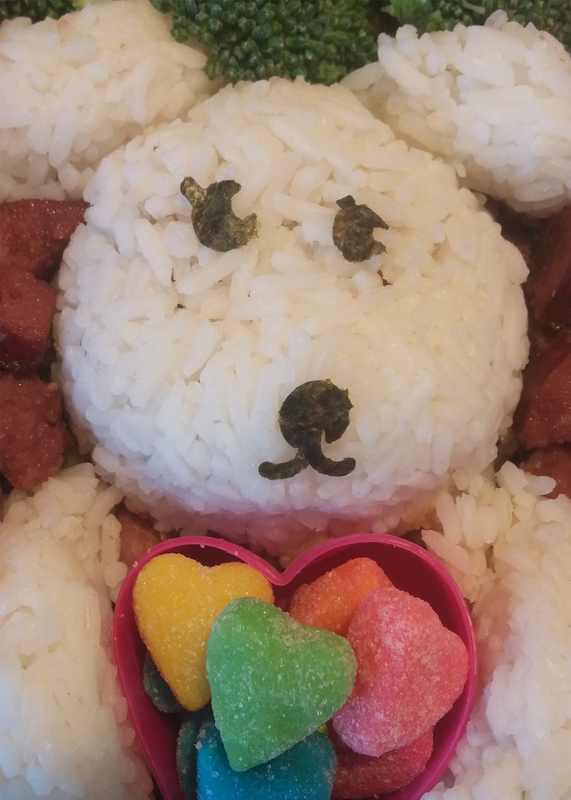 Get a good palmfull of rice, and for a little extra treat put a couple sauages in the center. 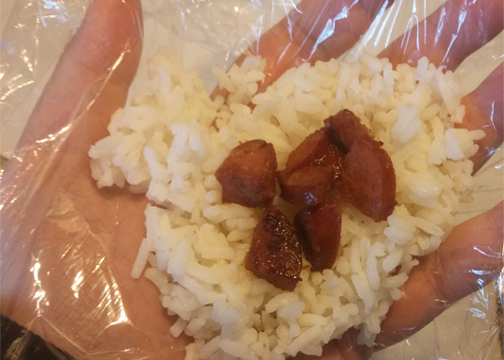 Now wrap the rice around the sausage so it’s no longer visible. 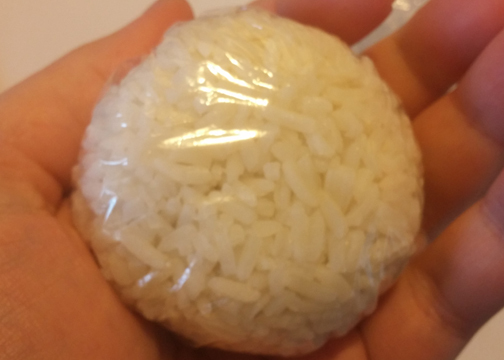 Firmly push on the rice until you have it in a rough circle. You want to pack it down, but be careful not to smush it. After you have it rounded out you can work on molding it into a more specific shape. You want it to be thin so the face isn’t to rounded, and the back if the head to be flat so that it will sit in the box nice. The hardest part to show and to explain, is that you want the top part of the head to be a bit slimmer than the bottom part of the head. What I did is used my thumbs to flatten the top half of the circle so that the nose portion of the head will stick out a bit. Once I had it a shape I liked I placed it in top of the sausage, the bottom of the head ressting on the treat box. Next I made the ears. Using the saran wrap like before I made a small oval that tapered down to a point at one side. Make two of these! I tucked them in along the head, that pointed side of the ear running along the top of the head. The last thing I shaped was the paws, again make two! I made these very similar to the ears only this time a bit bigger, and not so ponted. I made it very rounded on one end, but rather then shaping into a point on the other I just thinned it down. Tuck the round end around the treat box and the thin side in next to the head. The final step to your puppy is the face! This is very simple if you have a punch like I do. I used two sets of mouths and an extra eye to make the nose and mouth of my dog. If you don’t have a punch do not fret! Just carefully cut the nori into eyes and a mouth using scissors. Finish off your lunch by filling the treat box with some heart shaped goodies and your set!